Chief Jordan distributed crime statistics for September. Almost all crime except domestic violence is down. Chief Jordan was asked if he wished to comment on the ballot measure to allow medical marijuana dispensaries. He replied that since California passed a similar measure, more marijuana dispensaries exist in LA County than Starbucks. This could be the portal to massive misuse of marijuana. There is also currently large-scale abuse of the medical cardholder system. Dispensaries would be dangerous because marijuana cultivation is often run by drug cartels. The City would be unable to pass an ordinance prohibiting dispensaries within Milwaukie. The Chief stated he has other statistical data to support his opinion and will be happy to share it with anyone interested. A neighbor asked about a sound she heard on her cell phone after having called 911. The Chief stated that the major cell providers can use cell phones as GPS locators and employ this technology to aid responders to 911 calls for assistance. The sound was possibly related to being pinged for location. Chief Jordan said that the period to renew the contract for the photo radar van is at the end of December. He wants to gather statistics and have an informed discussion relating to the revenue and costs of operating the van and to evaluate whether a similar outcome can be had by getting rid of the van and employing one or even two motorcycle officers for speed enforcement. Neighbors commented that they had noticed that the speed has come down on Hwy 224 and on 99E where the van has most been employed and do not have an issue with the van since it is doing its job by reducing speeds. A neighbor said that another factor to consider is that the cost to ordinary citizens is probably lower because damages in crashes to humans and vehicles at a lower speed is less than if at the higher speeds we used to have. The Chief said a question we need to ask is whether we want the revenue the van generates or do we want the reduced speeds. He gets a lot of complaint calls, 95% relating to the photo radar van, which people feel is unfair since they do not have an opportunity to complain face-to-face to an officer about why they were speeding. He said we should also consider there is a higher risk factor involved in officers doing traffic stops than in the van recording speed infractions. He will try to have the information by next meeting so a discussion can occur. Treasurer’s Report: David Aschenbrenner reported that our bank account has about $20,000 in it. Sarah Smith made a motion that we move $3,000 from the Homewood Park fund to the administrative fund. It was seconded by Darlene Albertson and passed unanimously. Light Rail monthly meetings are the 3rd Monday of the month (October 18th) at the Public Safety Building at 6pm. Mr. Aschenbrenner reported that the next meetings will be discussing how to plug the funding gap and if that is possible, which features should be added back in. There was discussion about the parking problems that could be caused downtown if parking garages are not available. Mr. Aschenbrenner stated that there does need to be a permitting process for homeowners in Historic Milwaukie and Lake Road neighborhoods, and that he would be advocating for the restoration of at least part of the parking garages at Park and Tacoma. Clackamas County FD #1 Monthly newsletter available on: http://www.clackamasfire.com/documents/communitynewsletters/ and monthly in the NDA’s email at info@hectorcampbellnda.org. REMEMBER TO CHECK YOUR SMOKE ALARM BATTERIES. CCFD#1 HAS A PROGRAM TO ASSIST SENIORS INSTALL 10-YR BATTERY SMOKE ALARMS IN THEIR HOMES Contact CFD Fire Prevention at 503-742-2660. Hector Campbell School track: The PTA had asked to speak about their school track project, but were unable to attend. The cost is thought to be about $16k-$20k, with other grant funding being sought. The track will likely be around the lower school field. Neighbors discussed issues that came up a few years ago when this project was investigated, such as when neighbors can have access to it, maintenance costs, closeness to the school (i.e., child safety and security) and closeness to the ball fields. It was felt that the neighborhood would use it if they could have access to it, and it would be an asset to the neighborhood. School Safety Zones –The Engineering department has had to make a number of school zone changes in order to comply with federal and state regulations. The police and courts have been unable to enforce tickets written in some of the zones because the zone postings have not been correct and are challengeable. 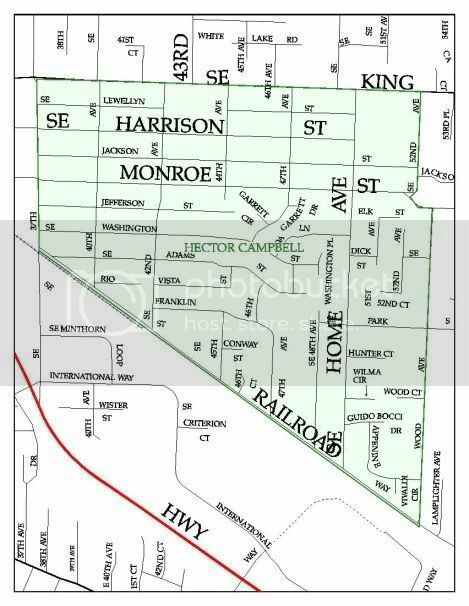 Mary Weaver went through the proposed Hector Campbell school zones location by location. 1. Move school zone signage on 48th north of Railroad higher up the road to just prior to the lower alleyway. Zone will be extended from end of 48th along to Park. It will be a When Children are Present zone only. 2. Home Avenue zone will be shortened to just around Park Avenue, with an end school zone sign added. It will only be a zone When Children are Present. 3. School zones on Washington and 46th and Adams will be removed, with just school crossing signs at the crosswalks on 47th and Adams and Washington. 5. The flashers and zone will be removed from Monroe entirely. Engineering Dept. staff said they anticipated moving it to Lake Road. Neighbors voiced strong concern about 47th Avenue needing more speed enforcement, possibly flashers at the bottom and top of the hill at Franklin. They were also concerned about the safety of the intersection of Park and Home and stated they felt flashers were needed at those locations due to speed and the safety of not just children but other walkers as well. Mary Weaver suggested this could possibly be addressed under the Walk Safely Milwaukie Program. 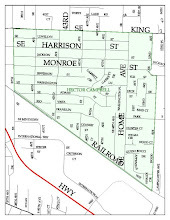 COMMENTS REGARDING SUPPORT OR OBJECTION TO THESE ZONES SHOULD BE DIRECTED AS SOON AS POSSIBLE TO MARY WEAVER AT saltriversucker1@comcast.net or dave@hammy.org. Walk Safely Program – The Neighborhood Traffic Safety Program that ran for the previous two years with city funding has been changed by the city’s Community Development Department to the Walk Safely Milwaukie Program with funding from the state gas tax. Mary Weaver described the ranking and awarding process, which PSAC is requesting to be changed so that PSAC will make the final decisions on which neighborhood projects get funded, as in the past. We hope to have some discussions about the ranking criteria established by the Community Development Dept. There are some issues due to differences among the NDA’s based on how money has traditionally been spent, the number of people involved as volunteers, and other factors. A neighborhood survey will soon be available on-line and in paper form to assess neighborhood concerns, projects desired to make the neighborhood friendlier to bike and walk and to increase livability, and to address traffic problems which might be interfering with biking and walking. Neighbors are encouraged to look around and observe problem areas so as to be prepared to answer the survey in mid-late November. Check the website at www.hectorcampbellnda.org for information on doing the survey on-line or email linda@hammy.org for a paper or emailed copy. a) Handouts on emergency preparedness and how to turn off utilities because of disaster events were distributed by Linda Hedges. She said that 6 neighborhood shelter sites will be available this winter, including Milwaukie Community Center at 42nd near Monroe, Gracepointe Church at 42nd and Monroe and Eagles Wings Ministries at Garrett Avenue near Monroe. These shelters are self-activating and could be available if needed during a winter storm or other emergency event. For more information check the Milwaukie Public Safety Foundation website at www.milwaukiepsf.org and click on emergency network. Other emergency preparedness information can be found at www.fema.gov and www.americanredcross.org. 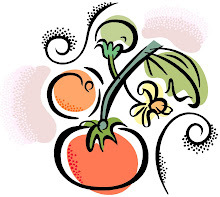 Next Meeting will be 7-8pm on November 8, 2010 at the Public Safety Building Community Room.